This week, I hiked at St. Josph’s Hill County Park, a hidden gem nestled between Novitiate Park and Lexington Reservoir County Park. During my hike, I was surprised by not only the spectacular views of the reservoir and the surrounding mountains but also the diverse array of plants in the park. While I was there, I saw everything from monkeyflowers to daisies to even silktassels. However, what struck me the most were the manzanita trees next to the trails. Manzanita trees are interesting because unlike most trees, their bark is smooth and red instead of lumpy and brown. I wanted to find out more about this phenomenon, so I did some research, and I discovered that tannins are largely responsible for the trees’ reddish color. Tannins are molecules found in many plants, including corn plants, grape vines, and even grass. They’re the astringent molecules that cause your mouth pucker when you eat. Although they are not particularly toxic to humans in low concentrations, they are particularly toxic to many herbivores and microorganisms, so many plants, including manzanita trees, use these as a defense against herbivore. However, although the tannins are responsible for trees’ bark color, they do not play a role in the bark’s texture. Although scientists don’t all agree on one reason for the manzanita trees’ texture, they generally agree that in the past, smooth bark offered better protection against herbivores and other invaders; for example, mountain pine beetles have a harder time climbing on smooth bark. I never expected a hike to inspire my interest in manzanita trees, but that just goes to show that hiking is not only a great way to exercise but also a great way to fuel your curiosity! This entry was posted in Newsletters on October 2, 2014 by eliac. A few weeks ago, I hiked at Almaden Quicksilver County Park which is nestled in San Jose’s rolling hills. During my visit, I not only enjoyed stunning vi ews of the Sierra Azul and Diablo Mountain ranges but I also learned a lot about the history of the area. I started on Mine Hill Trail, a relatively wide trail that leads up the ridge. Immediately, to my left, I saw an entrance placard introducing the park’s history and its significance not only to Gold rush miners but also to the Ohlone Indians—historically, they used cinnabar, a form of mercury, as a decorative pigment and as a trade item. Although, at first, I viewed the red ore on the sides of the hill simply as rock, as I learned more about its history, I began to appreciate its value, and I could almost see the miners sifting through the ore and the Indians bartering for animals. As I progressed on Mine Hill Trail, I saw the Reduction Works to my left, a massive yard that holds many mining artifacts, including a large pump that juts out. Initially, I wasn’t sure what the pump was for, so I took a quick detour to Deep Gulich Trail, and I learned that the pump was used to carry water out of the mines. It was interesting to look around the old structures and absorb what it must have felt to be a miner back then. As I finished my tour of the Reduction Works, I hiked back on Mine Hill Trail and passed by the old tramway, which was used to transport ore down from the mountain. Even though the cart itself is now long gone, the rocky hillside is still there—along with its essence. As I stood in front of the hillside, I felt more like a part of history rather than a bystander, and I wanted to learn more about the tramway. In school, we often view history as a thing of the past—a thing so static that nothing can be done to change it—and we sometimes lose sight of the connection between the past and the present. Thus, history can seem dry and insignificant. However, by learning through the senses, history comes alive, and what happened in the past holds more meaning in the present. This entry was posted in Newsletters on September 26, 2014 by eliac. Thanks for all of you who have queried about this weekend’s Stroller Hikes newsletter. If you have a yahoo e-mail, delivery has been delayed. Vertical Response, our e-newsletter provider, is looking into the issue. This entry was posted in Announcements on October 9, 2013 by eliac. Forgive the double e-mai this week: We have fixed a typo below. When I was in college, we partook in dead week, of no relation whatsoever to Dia de los Muertos or the Grateful Dead (though they frequented my college town until Jerry Garcia died). Dead week is the week before final exams, when studying is at an all-time high. Both campuses I attended tried their best to lighten the otherwise somber, overly anxious, or caffeine-jumpy mood, by scheduling twice-daily “scream-fests” during which doors and windows would be propped open (even when it was dumping rain outside), and every person on campus would howl, shout, and scream, for one minute. It was an amazing sensation – you’d have been isolated, neck deep in books for hours straight, then pop up and howl, feeling a sense of belonging with other studiers near and far. I’m back in the classroom teaching this year, and Monta Vista High School is as high-stress as any high school or junior college can be, with student and parent expectations very high, and API scores at a record high that administration and staff hope we can maintain or grow. I love teaching, but this is the worst time of year for me, and all of my students. The stress can be unbearable to everyone – I’ve seen all types of emotions in the last two weeks. The anticipation of end-of-semester grades, the intense studying before finals, the eminent personal obligations for the holidays – these all take a toll. I finished grading an Algebra 2 exam this week. I try to be the reliably fast teacher, when it comes to grading, but this exam slowed me down a great deal – I must have spent 8 hours grading about 90 2-page exams. That’s ridiculous, except that the stress has a hold on me, too. I want to give my students a strict standard to work towards, but without partial credit, grades would certainly suffer. Likewise, without lots of written feedback on their work, I feel that I haven’t given them the coaching they deserve. In the end, about half of the students earned Ds and Fs on the exam anyway, and I stressfully entered scores into my digital gradebook, expecting the worst. In all of my years of teaching, I have never had a student fail my course without working at it, by not turning in work, skipping tests, or cheating, and I worried this one exam might create an exception to that pattern. But even my student who earned a “2” (yes, that low) is still passing. It was a healthy dose of reality for me, and gave me pause. I had fallen into the emotion-laden pit many students fall into at his time of year, assuming that a single test can mean ultimate doom for any of their academic pursuits (which is frankly impossible). Almost no single event can dictate life-long failure. As parents, we can coach, lead, teach… and we hopefully show our children, through our own successes and failures that we manage through the good and bad, through the stress, and things end up falling into place. In science, we learn that experiments will likely fail (at least the first time), and we can learn a lot from our failures. The same is true for all life experiences. This is the lesson I hope that my kids learn for themselves. Some of my favorite Stroller Hikes parents are excellent at letting their kids experience failure. No, they don’t impose negative experiences on their kids. These are the parents that let their kids “shake it off” on their own, when they trip and fall. These are the parents who let their kids figure out to get their own drinks, even if it means 10 more minutes of clean-up time, and a sticky floor. These are the parents who let the kids try to build that tree house, robot, or telephone (all things I tried when I was young, without intervention from my parents, as far as I am aware, and without complete success). So I’ll put my neck out and try something, then work with the results. (Hey, this is how Stroller Hikes came to be.) I’d want my kids to do the same thing. And if the stress comes to a head? Teach them how to shout, yell, scream, and bark, then listen for others feeling the same way. p.s. I wrote this essay on Wednesday, December 12th, after finally finishing grading those pesky exams. Since then, I have seen my son, Max, face pine boards and break through them time and time again (seven times, to be exact) with his hands, feet, and elbows, as part of his school’s Kicking for Miracles fundraiser. I asked him if he was scared. I asked him if it was hard. “Yes,” he said, “but I just had to focus and work really hard to do it. 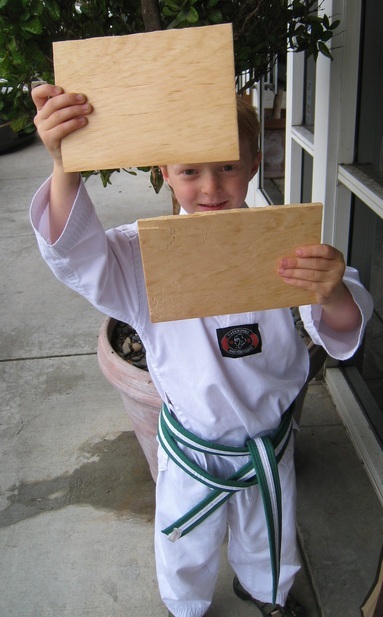 It was fun.” He helped his Tae Kwon Do school break 1000 boards and raise over $12,000 for Lucille Packard Children’s Hospital, which provides care and research for ill children, regardless of that child’s ability to pay for it. 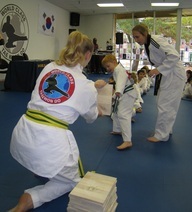 That’s him, with his 6th broken board at top, and working on his 4th board with a side kick, at right (with one of his teachers, Mrs. Sroka, looking on). On Thursday and Friday of this week (and perhaps for days to come), my school was contending with its own stresses – this time imposed by what we imagine is a disturbed student with a grudge to bear (I won’t go into details, but several media outlets in the area have; it is definitely dwarfed by the tragedy in Connecticut on Friday). I’m hoping we can break through that cloud of stress with a little elbow grease and some healthy perspective. I taught many of my students on Friday about barking and yelling on “dead week,” and did my best to remind them that their teachers were there as guides and caregivers, particularly during times of stress. As we screamed together for a minute, I’d like to think some of the stress subsided. This entry was posted in Newsletters on December 16, 2012 by eliac. This entry was posted in Newsletters on December 15, 2012 by eliac.